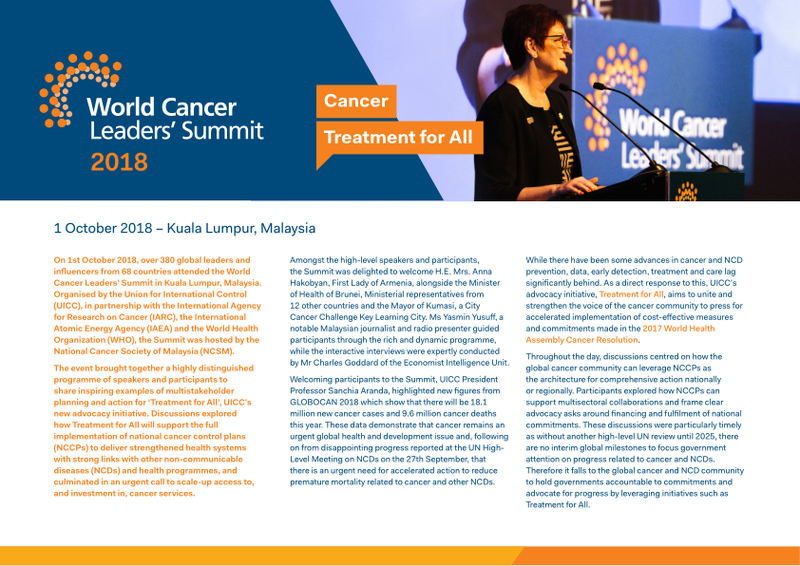 As part of the 2017 World Cancer Leaders’ Summit programme, a number of official side sessions were organised by UICC partners to explore the future of cancer control and how we can tackle some of today’s most pressing issues to achieve our shared goal of reducing premature mortality from cancer and non-communicable diseases (NCDs). Click on the accordion titles below for more information on each side event. Competition running 13 and 14 November to award a non-medical innovator in the field of cancer care organised by Astellas. In the afternoon before Summit, Astellas hosted the second edition of the Oncology C3 Prize competition. The Astellas Oncology C3 Prize is a global challenge designed to acknowledge and support non-medical innovations to improve the cancer care experience for patients, caregivers and their loved ones. Over 120 applications were received from 20 countries. Five finalists were invited to pitch their ideas to a panel of judges and a live audience, who assessed the ideas based on plausibility, creativity, originality, and ability to implement the innovative idea for future applications. Hernâni Oliveira from Portugal was announced as the Grand Prize winner during the closing reception of the Summit. His entry, the HOPE PROJECT, consists of a two-part app developed to help paediatric cancer patients and their parents solve issues related to medication adherence and the sedentary lifestyle of children diagnosed with cancer, as well as help parents further understand and explain complex cancer treatment procedures. The Economic Intelligence Unit’s Latin American Cancer Control Scorecard (LACCS) was launched recently. This is a tool which supports governments and stakeholders in identifying cancer control implementation successes and gaps, and helps guide and refine further action. Panellists discussed ways cancer advocates could use the scorecard to help frame cancer planning debates and discuss cancer priorities across the region. The scorecard was mentioned as a particularly useful tool prior to or immediately after elections with respectively running candidates or newly elected government. Dr Mohar raised concerns about the unacceptable rates of childhood leukaemia in Mexico, and the role that the scorecard could play in re-framing the discussion to increase investment in its detection and treatment. Throughout the session, the panellists emphasised the critical importance of engaging stakeholders for successful national action. Although securing sustainable financing for cancer control was an important element of the discussions, the session concluded that cross-sectoral and transparent partnerships with civil society, academia and the private sector are key to addressing the lack of data for cancer. The merits of mutli-stakeholder partnerships for cancer and other NCDs are well recognised and we are increasingly seeing new partners engage to improve access to quality cancer services. The aim of this session was to explore how these partnerships have been developed and how we can sustain these in the long term. Throughout the session, both speakers and audience members emphasised the need to unite partners based on a clear common objective. Drawing on experiences from C/CAN 2025, participants stressed that no single body can bridge the cancer care divide alone; instead, we need to work together to build and support sustainable systems for patients. These shared aims are the foundation for building trust between partners and are required to overcome challenges, such as fragmented health systems and access to timely treatment and care. Building on this, Mr Ingo Schroeter drew out two key roles for partnerships within his field of work: tackling the missed opportunities for early detection of cancers and improving the delivery of quality and effective treatment. Looking at Mexico, Dr Cervera Ceballos highlighted the move to develop molecular diagnostics to better understand the drugs from which patients would benefit, while Dr Netto highlighted how IBM has leveraged the Watson platform to improve the processing and use of data in programme design and delivery. 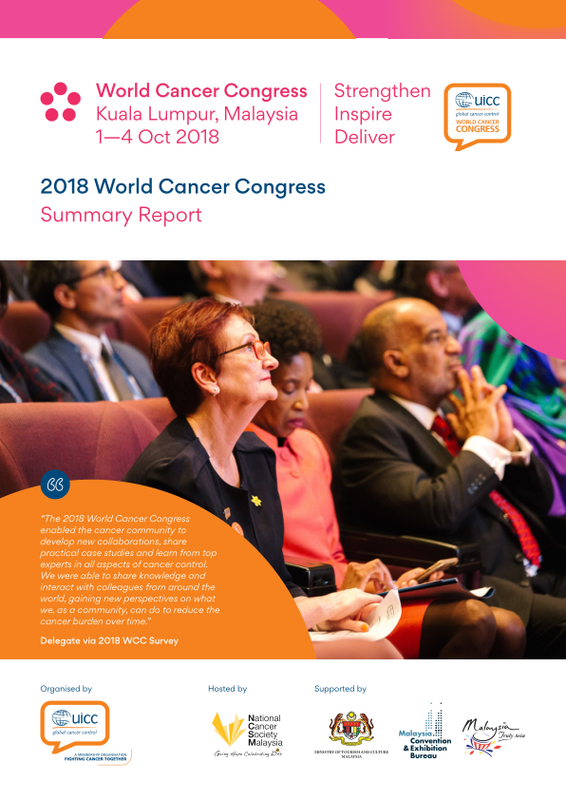 Globally, countries are examining how they can build safe, quality and equitable cancer services, and ensuring access to medicines is a key part of this effort. In low- and middle-income countries particularly, patients’ access to medicines varies significantly. Poorer patients or those living in rural or remote areas find it most difficult to access treatment and care and often experience poorer health outcomes. With this in mind, the panel explored how different stakeholders can play their role in bridging the gap between services that patients need and what the health system can provide. Kicking off the discussion, Dr Rifat Atun posited that we need to start by assessing health system structures in order to clarify the problems. For example, Brazil and a number of Caribbean states have guaranteed access to treatment within their constitution; however, patients are still struggling to access the services they require. Building on this point, Dr James Hospedales discussed how, due to a lack of regulatory capacity, some Caribbean states have not managed to register any new cancer medicines in the last four years and that, without this, access to medicines is denied. The participants felt strongly that, having identified the main barriers to access to medicines, the cancer and global health communities need to mobilise governments and other stakeholders to develop solutions that put patients at the centre of efforts and leverage innovations in treatments and technology. Highlighting examples from Brazil, Dr Maira Caleffi emphasised the powerful role that cancer patients have played in advocating for improvements in timely access to treatment. How can the promise of personalised healthcare impact cancer control in LMICs? Improving the effectiveness and cost-efficiency of cancer treatments will be critical to meet the needs of the growing number of cancer patients over the coming decades. The promises of personalized medicine include the possibility of increased survival and potentially more cost-effective oncology treatment as drugs can be given to those patients most likely to benefit. Despite many remaining challenges, there have been significant advances in the use of personalised medicines across high-income countries, and questions are now being posed about their roles within low- and middle-income settings. The panel provided several perspectives on identified needs, challenges and key learning points linked to the increased use of personalised medicine in their own contexts. Mr Gary Reedy opened the session by highlighting important successes of screening programmes on colorectal cancers in the US that also include biomarker testing. Biomarker testing comes with logistical and financial challenges and Dr Horacio Astudillo-de la Vega from Nanopharmacia Diagnostica highlighted the lack of standardization of testing practices as an important gap. Panellists agreed on the need for clear regulatory and legal frameworks to ensure respect of universal and equal access to healthcare and patient protection against discrimination. Mr Diego Paonessa talked about the importance of including the patient voice within these different regulatory processes. All speakers highlighted the need for greater collaborations across a wide range of actors in healthcare to deliver both standard and personalised medicines more effectively. Where countries are looking to develop personalised health care plans, participants agreed that the first step needs to be an assessment of the national contexts to identify critical opportunities to improve health infrastructure, treatment guidelines and human resources for health. The discussion kicked off with reflections on the need for urgent action to improve access to quality cancer prevention, early detection, treatment and care services if we are to meet global targets on reducing premature mortality from cancer and NCDs globally. Considering this, Prof Franco Cavalli argued that addressing cancer sustainably means strengthening the whole health system and, as a result, many governments hesitate to take action. Echoing this, Dr Pablo Kuri highlighted the challenges his Ministry faces in balancing investment across the spectrum of cancer control activities in order to deliver effective and efficient services in a country as big as Mexico. Tackling inefficiencies in financing was raised as a key next step for all countries by Prof Matti Aarpo. Drawing on work from the OECD and the All.Can project, he argued that around 20% of health spending in Europe was deemed to be wasted and that there is a critical need to improve efficiency to deliver better patient outcomes. Reflecting on how improvements have been delivered in Cali, Colombia, Dr Alexander Duran stressed the importance of engaging stakeholders to build consensus for long-term actions. Mr Herb Riband, Amgen Inc.
Nearly 300,000 women die from cancer in Latin America each year. This not only places significant burden on health systems but also on patients and their families. With this in mind, Ambassador Sally Cowal opened this session by highlighting how action to prevent, detect and treat women’s cancer in the region poses significant challenges, but also brings with it fantastic opportunities for improved outcomes. Dr Arnold Baskies highlighted the dual epidemics of breast and cervical cancer amongst women in the region. Thinking further about how we can address this, he posited that we need to leverage opportunities to engage women through reproductive and primary health as key service delivery points. We also need to work better within the health system to ensure that women can access the cancer treatment and care they need. Dr Armando Sardi echoed this call, highlighting that, in fragmented health systems like Colombia’s, many women have to apply for each phase of treatment, which is associated with significant costs and time delays. Inconveniences such as these underscore the difficulties far beyond diagnosis and treatment that women face, and the importance of considering all of their needs in order to truly put the patient first. As examples, Dr Sardi introduced their innovative efforts in key stakeholder engagement for improved referral networks through the health system and in mobile health applications to better support patients. To close the session, Mrs Mavalynne Orozco-Urdaneta further urged participants to put themselves in patients’ shoes, given that we so often represent the voices of patients and directly impact their quality of care and quality of life. How is the local research agenda set? What are the questions to be answered locally that fit into the global research agenda? What are examples of success in cancer centers of excellence? How is research being integrated into patient care? What are the policy implications for city leaders, and other stakeholders? How can partners better work together to address research challenges? Population centers (cities) as centers of excellence and network integration will be presented. Telepathology and other partnerships to insure success in every setting will be characterised. In November 2015 Cervical Cancer Action (CCA) launched a five-year initiative called the Cervical Cancer Prevention Initiative (CCPI) with the vision to expand and scale up global efforts to prevent cervical cancer in low- and lower-middle income countries over the next five years. The CCPI is an association of partners with the goal to ensure that all young adolescent girls receive the HPV vaccine and every woman is screened at least once between the ages of 30 and 49—and that she has access to pre-cancer treatment when necessary. This workshop provided a unique opportunity for cancer leaders around the world to exchange knowledge, skills and experience on current efforts in low- and middle-income countries to increase HPV vaccine and cervical cancer screening rates. Cancer leaders discussed working together to create immediate concrete steps on how to work more effectively together and forge the appropriate collaborations to scale up these critical prevention services. Many thanks to the sponsors of the 2017 World Cancer Leaders’ Summit side events.